Elephant figurines for your collection or to give as gifts. 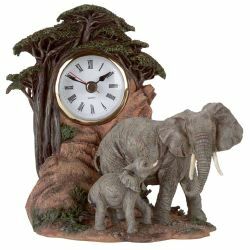 Porcelain elephant families, elephant clocks, elephant plates, and more. This is fine ground white clay, molded and fired in an oven for eight hours at 1200 degrees. Finished with a glazed, under-glazed, or "bisque" finish. Glazing produces a high gloss; under-glaze produces a matte finish. Bisque is a matte finish without glaze. After finishing, the item is "cooked" for six hours at 800 degrees. CountryMall Gifts and Decor offers a variety of elephant figurines for you to choose from, plus a large selection of other animal and bird figurines. Search for something for you own collection or to give as a special gift.